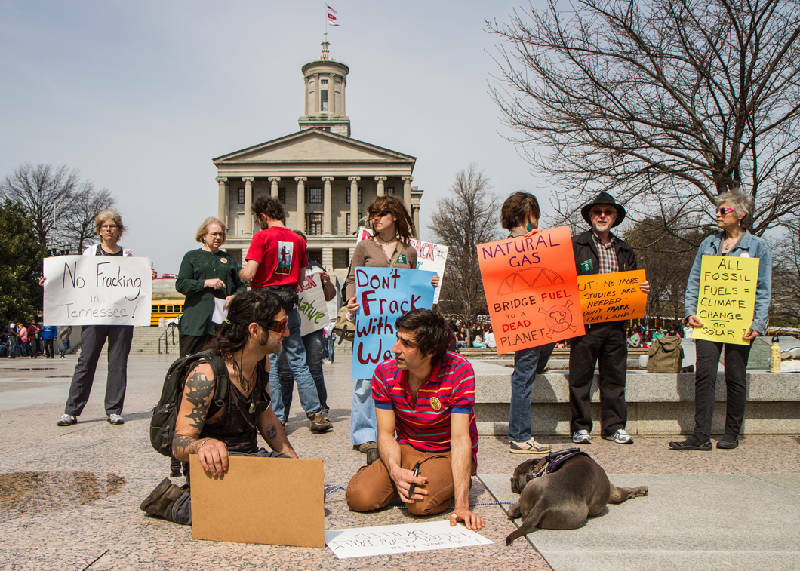 Protesters gather on the plaza across from the state Capitol in Nashville on Friday to speak out against a University of Tennessee plan to allow hydraulic fracturing to extract natural gas on a state-owned tract of rolling woodland. NASHVILLE - The Tennessee Building Commission unanimously approved a request Friday by the University of Tennessee to allow hydraulic fracturing, or "fracking," on 8,636 acres in the university's Cumberland Forest. Finance Commissioner Mark Emkes, who sits on the executive subcommittee of the commission, made a motion to approve the request after hearing three hours of comments from the university and 25 other private speakers for and against the proposal. The university had asked to be allowed to lease the land and its mineral and oil rights to an energy company as an opportunity to research the impacts of hydraulic fracturing -- a method of mining natural gas by injecting high-pressure water or nitrogen gas and chemicals into shale rock to cause fractures for gas to escape. The lease term is for five years, with three five-year renewals -- or as long as there is enough gas being extracted to make a profit. Emkes said he supports the move to research the drilling method because no other meaningful research on industrial practices or environmental impact was being conducted at any of the 350-plus fractured mining sites in the area. Although the proposal passed, Emkes said he wants a conference before the bid process to ensure there is significant interest from energy companies for the proposal -- and to clear controversy that the bid proposal, originally written in 2008, was engineered with a specific company in mind. State Treasurer David Lillard seconded the motion, saying because the mining research would happen on public land, it would be more open to public scrutiny. The approval means the university can advertise the bid, vet proposals and return to the building commission for final approval. Opponents of the proposal range from UT students, environmental groups and concerned residents who say the drilling method has caused serious environmental and public health problems elsewhere in the country. Hydraulic fracturing can release trapped methane gas and radioactive minerals that have been locked deep in bedrock. If those materials leak into ground and surface water, there are devastating effects to wildlife and people, critics say. Scott Banbury, conservation chairman for the Tennessee Chapter of the Sierra Club, an environmental conservation group, said immediately after the meeting the commission's decision is "opening the door for an industry that will be coming into the area in a big way." Banbury said he didn't have a problem with researching hydraulic fracturing, but "the Sierra Club thinks we should do that research where we are already fracking on public land." There are currently hundreds of mining sites on state-owned land in Northeast Tennessee, near the university's tract. Banbury and others also told commissioners they did not feel research funded by energy companies would be completely unbiased. Also, because the university stands to make money by selling natural gas, its research may be skewed, Banbury said. "There's no way to avoid that heavy funding influencing research," Banbury told commissioners. But Larry Arrington, chancellor of the statewide Institute of Agriculture for the university, said universities frequently partner with industries to do research. Citing UT's dairy research program, he said profits for the school are not uncommon. "We sell the milk!" he told commissioners. Acknowledging environmental concerns about the university's property, which is made up of about 13 square miles of forest land in Morgan and Scott counties, Arrington said whatever company wins the bid will be required to follow state guidelines for mining. "We have a very vested interest in making sure this property is used in an appropriate way," Arrington said. Countering the specter of subjective research, Arrington said "safeguards were in place" to prevent conflicts of interest. "In all cases, our job is to provide real scientific answers to questions people in Tennessee have," Arrington said. "We hope the ultimate goal is to get best management practices [for the mining industry]." Arrington says the program will lead to research of ground and surface water quality, soil quality, site reclamation, rock formations, advanced fracturing techniques and ecosystem disturbance. There is no specific way to halt the mining if damage is done to the surrounding area, but Arrington said the "spirit of the contract" requires the company to work within best practices. Two hours before the specially called building commission meeting, nearly 50 residents opposed to hydraulic fracturing gathered for a rally on Legislative Plaza. Holding signs that said "Fracking poisons air and water" and "Don't frack with our water," ralliers spoke out about the dangers associated with the half-century-old mining method. Josh Moore, a student at Middle Tennessee State University in Murfeesboro, is in a group called Students for Environmental Action. He recently went with the group to a town in West Virginia where hydraulic fracturing is commonplace. "We toured one of the fracking sites. It was like a scene from a movie -- specifically 'Alien,'" Moore said. Along with the mining methods impact on environment, Moore was disturbed by its perceived effect on people. "There was this sense of hopelessness from the people in the community. They hated blowing up their land, but they said, 'This is our economy,'" Moore said. During the special called meeting, Arrington said UT had heard from other universities interested in getting involved with the program if it is ultimately passed. He said Vanderbilt University, Virginia Tech and others had expressed interest.